1) In the schedule view, find the call sheet you need to change and click the dropdown arrow next to the blue button. 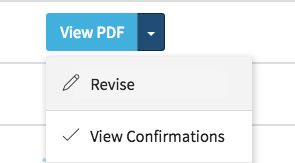 In the dropdown menu, click “Revise”. 2) This will take you into the call sheet editor. At this point you can make any changes you wish and they will be saved as a draft. Just enter “Revision” mode at any time to continue editing the draft where you left off. Again, none of your revisions will be seen by the cast or crew until you choose to re-publish the call sheet. Once you’ve made the needed changes, you’re ready to republish the call sheet! 2) There are three different “methods” for republishing, as seen below. A) “Resend to Initial Recipients” - Select this option if you want to resend the call sheet to the people that you originally sent the call sheet to. Any previous email / sms settings and attachments will be used again, so if you want to change anything about the messages from last time (such as including a different attachment or not sending sms messages), then choose the next option instead. When you choose this option, you’ll have the option to reset or not reset the view counts and confirmations upon publishing. .C) “Update Silently” - Selecting this option will update the PDF and the information on the call sheet, but it won’t send any emails or text messages and won’t reset the views / confirmations. This option is great for fixing small errors (like typos) that should updated, but that aren’t big enough to bother notifying people about. 3) Select your preferred method of republishing and follow the prompts. 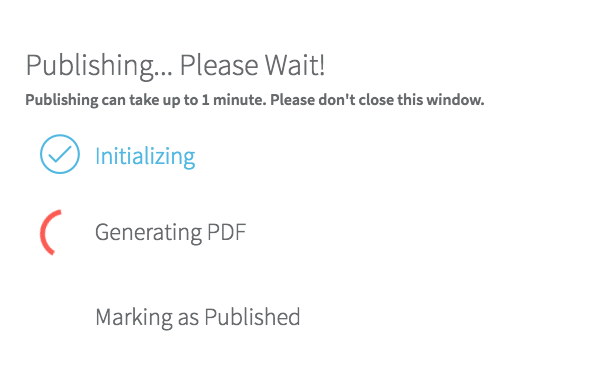 Once you click “Re-Publish”, a loading window will appear showing the publishing progress… please wait until publishing is complete before closing the window or navigating away. Once this loading process is complete, you'll see a success message. Congrats! Your call sheet has been successful sent out and you can start tracking views and confirmations.